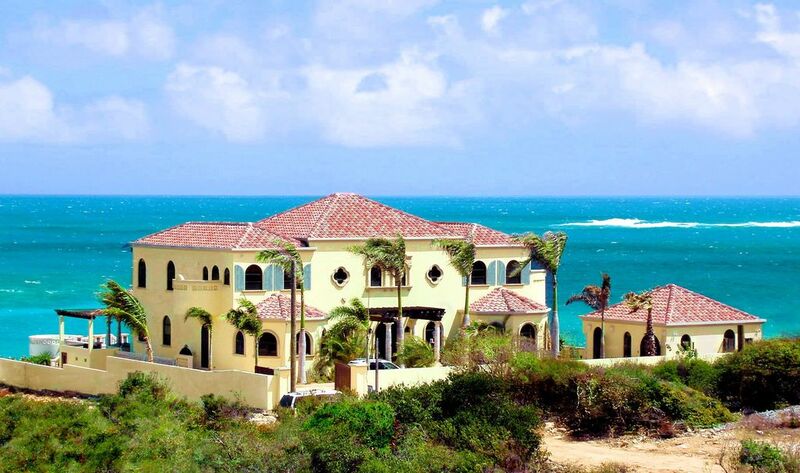 Designed by Anguilla’s own acclaimed architect Carl Richards, Villa Amarilla's design is Caribbean with an Italian influence in its yellow stucco walls, turquoise shutters and red tile roof. The cool island interiors by the owners, in collaboration with award-winning Dallas interior designer David Salem & Associates, have hints of Moroccan flair. With spacious indoor and outdoor living and dining areas, Villa Amarilla offers ample room for a large group to gather or a variety of havens for an individual to find solitude and relaxation in 9,000 gorgeous square feet. Located on Anguilla’s Leeward north side, on the Sea Rocks of Island Harbour overlooking some of Anguilla’s most beautiful reefs, you will never tire of the mesmerizing view as it changes continually with the tides from iridescent aquas to deep sapphire blues. In addition to the beauty of the surf breaking on the reefs, the panoramic views include Shoal Bay Beach to the west and Scrub Island to the east. Few villas in Anguilla offer a heated pool, A/C in every room (including bathrooms), a full gym, an indoor and outdoor sound system, and free maid & concierge through our property manager! Anguilla has so much to offer, especially in regards to restaurants, so please take advantage of her expertise. This villa was built with every detail in mind. The numerous seating areas are all unique and comfortable, the furnishings have an elegant island theme, the pool features built-in lounges to soak up the sun while remaining cool, and the landscaping is truly astonishing. All full bathrooms have inside showers. Three bedrooms have outside showers along with inside showers. There are a few small beaches within walking distance, including Island Harbor Beach. The best beach on the island is only a quarter mile away! Beach is 5 min walk from the Villa. The most incredible, completely unobstructed view. The sunsets are amazing! The villa sits right on the water. There is no beach, but rocks. However, the closest beach is about a 3 minute walk from the house. There is free calling to the US. A/C units In every room and bathroom, with multiple units in larger living areas. The linens are Sferra high thread count. The internet is available in the whole house, including outside by the pool. The Gym has Recumbent bike & Elliptical machine. Also ping pong table and free weights. There is also mats for stretching. Plenty of place to sit on comfortable chairs. Yes, there is a dishwasher. There are 4 refrigerators. One in the kitchen, one in the laundry, a small one in the bar and a small one in the gym. Gourmet kitchen with GE Profile appliances. Fully stocked with everything you need. Additionally, there is an outside dining area by the pool that seats 8. 7 TV's around the Villa. TV in living room has Satellite. The other TV's are hooked up to local cable. Sonos sound system for wireless music streaming from your phone to the outdoor and indoor living spaces. Extensive DVD Library in the media room. Landscaping is a priority of ours! All 4 upstairs bedrooms have access to a very large balcony. 2 of the 4 upstairs bedrooms additionally have private balconies. Great pool. Very large and heated. Other Activities: Some of the best snorkeling in the world! We welcome you to Villa Amarilla Anguilla. Rates include the exclusive use of the villa and its staff. In order to keep the villa in peak condition for our renters, we do not allow smoking or pets. Rates are subject to change at any time, unless confirmation is received. The villa will be available to renters at 4pm on the day of arrival and must be vacated by 12pm on the day of departure.